Qui sont les petits immigrants britanniques et les enfants travailleurs migrants? Louisa Caroline Stirling Birt (nee Macpherson) was born in Scotland in 1840 and was the younger sister of Annie Macpherson, the noted children’s and widow’s welfare activist. While convalescing at her sister’s home, Louisa became increasingly involved in Annie’s work in London’s East End. In 1870, Louisa accompanied Annie to Liverpool where both were struck by the plight of the city’s impoverished children. They came to realize that conditions in Liverpool were perhaps even worse than those they had witnessed in London. An already desperate situation had been exacerbated by the influx of starving Irish immigrants who had come to Liverpool in 1848 and 1849 to escape the ravages of the potato famine. Of the 300,000 Irish refugees that came through the port, 80,000 would remain in Liverpool, swelling the ranks of paupers and adding to an already desperate housing shortage. Overcrowding and unsanitary living conditions fuelled epidemics of several deadly diseases. A group of Liverpool’s concerned citizens, wishing to mirror Annie Macpherson’s work, invited her to attend a meeting in November 1872. As fate would have it, Annie sent Louisa in her stead. By the meeting’s end, fourteen men had committed to establishing the Liverpool Sheltering Home to address the needs of destitute women and children. Impressed by her zealous devotion to the cause, the group asked Louisa Birt to head the institution. The first Liverpool Sheltering Home was situated on Byron Street in the heart of the city’s most disadvantaged area. Its doors would open on May 1, 1873. Thanks to the generosity of John Houghton, the premises were provided free of rent. Almost immediately, the facility was occupied to its maximum capacity. Within its first year of operation, over 600 children applied for admittance but sadly, only 360 could be accommodated. Within a decade of its opening, it was recognized that the Byron Street property could no longer support the housing and training needs of the children. As a partial solution to the problem, a home for girls was opened in 1888 on Sugnall Street. 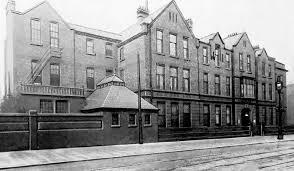 Once funds became available, the adjoining Myrtle Street property was purchased and in 1889 it became the site of the new Liverpool Sheltering Home. From the onset, it was evident that regardless of the size of the home, it would never be large enough to accommodate the number of children needing food and shelter. As early as 1873, Mrs. Birt looked towards Annie Macpherson’s emigration program as a means of easing the burden on available resources. While planning to accompany her first group to Canada, Mrs. Birt received an offer from Colonel James Laurie, a resident of Nova Scotia. Colonel Laurie lived at Oakfield, a lakeside estate situated near Halifax. Not only did he offer to temporarily house the children at Oakfield, he also agreed to fund all expenses incurred between the children’s arrival and their placement in a home. To further advance the cause, Colonel Laurie convinced the Nova Scotia government to defray part of the cost of the children’s passage. With the necessary arrangements in place, Mrs. Birt departed Liverpool and arrived in Canada on August 24th. 1873, accompanied by her first group of 76 young people; 6 women, 26 girls and 44 boys. Colonel Laurie helped place the children but it fell to Mr. Arnold, an Episcopalian missionary, to care for them while at Oakfield. During the following three years, Mrs. Birt would make several trips between Liverpool and Halifax. In 1876, citing failing health, Colonel Laurie was forced to withdraw his placement services and the use of Oakfield as a receiving home. In total, Mrs. Birt and Colonel Laurie placed some 550 children in Nova Scotia households. Faced with the loss of the Oakfield receiving home, Mrs. Birt was forced to seek an alternate destination for her child immigrants. By this time, her sister, Annie Macpherson, had redirected her immigration focus from Knowlton, Quebec to a receiving home in Galt, Ontario, leaving the Knowlton facility underutilized. Annie suggested that her sister make use of the Knowlton home; an offer Mrs. Birt was only too happy to accept. Beginning in April 1877, Louisa Birt would begin a 25-year routine of twice yearly bringing children from Liverpool to Knowlton. The children would be left in the care of Knowlton’s superintendent, Elizabeth Meiklejohn. Following Miss Meiklejohn’s retirement in 1904, Mr. A. Drummond would assume the position of Knowlton’s Superintendent. Prior to his appointment, he had been the Head Teacher at the Liverpool home. Mr. Drummond was no stranger to Canada, having accompanied Mrs. Birt on several tours of inspection. It was reported that Knowlton would attempt to place siblings in the same household or failing that, in nearby homes so that contact between them could be maintained. Similar placement efforts would be made on behalf of those newly arrived children whose siblings had been sent before them. Despite the home’s best efforts, this was not always possible. 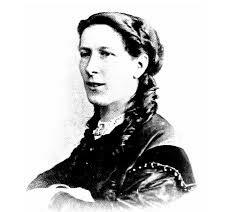 Louisa Birt would continue her work until 1910 by which time advancing age and failing health would prevent her from undertaking further Atlantic crossings. That same year, Louisa Birt would hand over the reins to her daughter, Lilian Birt. The outbreak of war in 1914 brought about a cessation in the emigration of children. The Liverpool Sheltering Home decided to close the aging Knowlton facility in favour of combining operations with the Macpherson Home in Stratford, Ontario. It was determined that future placements of children from the Liverpool Sheltering Home would be facilitated through the Stratford Home. Louisa Birt died on May 7th. 1915. It is said of Mrs. Birt that she had a true affection for the children placed in her care. She would assist with the bathing of the younger children and delighted in telling them stories. Her care and concern for the children continued until her passing. Following the end of WW1, the work of the Liverpool Sheltering Home and the Annie Macpherson’s homes in England were unified under the supervision of Lilian Birt. In Canada, the Stratford home was closed and its operations relocated to the Marchmont Home in Belleville. 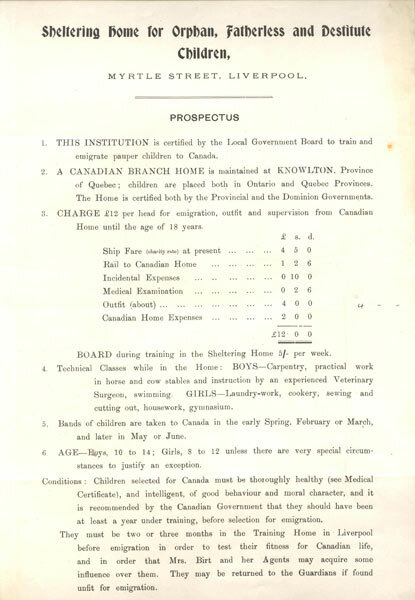 In 1925, all of the records along with the Marchmont Home were transferred to the Barnardo organization and as such, the Birt’s involvement in the child emigration program had come to end. 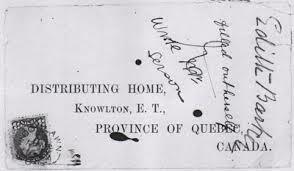 From its inception until the end of its Canadian operations, the Liverpool Sheltering Home, under the direction of Louisa Birt, would send approximately 6,000 children to Canada, of whom 4,558 would pass through the Knowlton Home. Enter your email address to follow our blog and receive newsletter notifications by email.